When it comes to inclusive education, one of the most important links in the chain is the teacher who teaches the teacher – the person who instructs future early learning and child care educators and K-12 teachers on how to see every child as an individual learner, and how to end exclusion in their centre, classroom or school. Soucy made these remarks at the recent 2018 National Inclusive Education Awards presentation, just before he introduced Nancy Hallihan-Sturgeon, one of seven of New Brunswick’s best “exclusion busters” to be honoured at a ceremony held at Government House in Fredericton on Thursday, February 9. Presented by the Canadian Association for Community Living (CACL), the certificates recognize individuals or groups that have made or are making an outstanding contribution to inclusive education in their province or territory. The event, organized by NBACL on behalf of the Canadian Association for Community Living (CACL), is the focal point for celebrations marking National Inclusive Education Month. Heather Fowler, Department Head of Business, Health and Continuing Education at NBCC Miramichi, nominated Ms. Sturgeon for the award. “Nancy creates an educational environment that fosters respect for inclusion and diversity.” Ms. Fowler wrote in her nomination, citing how the instructor integrates activities, speakers and projects in her classes to ensure that her students learn about and understand inclusive education before they enter the field as early childhood educators. “In the Winter term, as part of the Inclusion course, Nancy regularly partners with NBACL to facilitate their Each Child Matters and Engage Reflect & Plan training, so that her students receive 48 hours towards the Association’s 60 hour certificate in Inclusive Education,” Fowler recounted. She also “consistently and enthusiastically promotes and engages the students in various volunteer activities to promote inclusivity,” Fowler added, citing how Ms. Sturgeon has worked with her students to promote Orange Shirt Day and National Child Day. Annick Daigle, Coordinating Instructor for the College’s Early Childhood Education program, agreed. 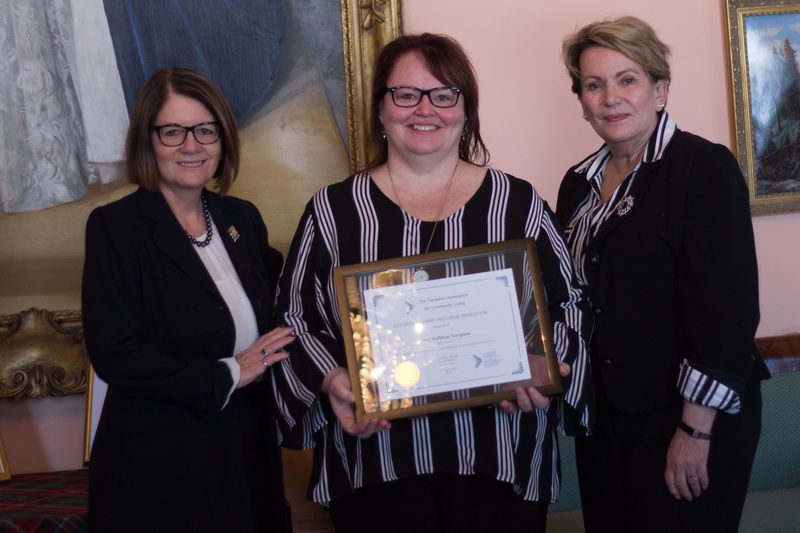 “Nancy has consistently shown a commitment and passion for inclusive education that is both demonstrated in her teaching and is reflected in the students that go on into the profession,” Heather Fowler summed up.